A beautiful aerial view of the landscape near Sandwich Bay in Southern Labrador where a river meanders its way around the wilderness on the way to the Mealy Mountains. Lush greenery and trees flourish in the center land masses of the river and thick forest grows on the either side. Aerial view of a River near Sandwich Bay enroute to the Mealy Mountains in Southern Labrador, Labrador, Newfoundland Labrador, Canada. 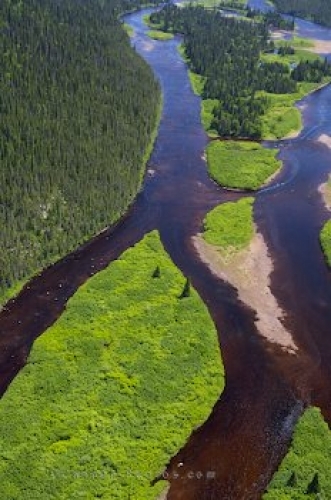 Aerial of a river that splits around the landscape near Sandwich Bay in Southern Labrador.